He was born in Kent and worked in central London before moving to Leeds in 1977. 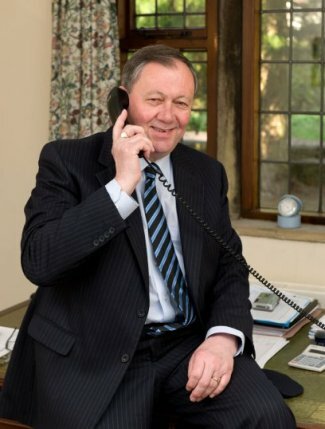 Before starting Clemmence & Co, John was a partner for 15 years in a national firm of Chartered Accountants. He has a wide range of experience in audit, accountancy and taxation matters and has also carried out a lot of corporate finance work. John's other interests have always included sport, in particular cricket and football. For five years of his cricket career, he played at the test ground at Headingley for Leeds Cricket Club in the Yorkshire and Ridings leagues. Throughout this period he was a regular feature in the England dressing room, bowling to the England and visiting test players in the nets immediately prior to commencement of play on test match days. He claims Sir Ian Botham and David Gower amongst his victims. He also played senior amateur football for several years and is seen (left), playing against former Leeds United and England player Norman Hunter in a charity match. He now plays competitive golf at Rawdon Golf Club. Janette is John’s secretary and has been with Clemmence & Co since 1993. She previously worked in the personnel department of Yorkshire Post Newspapers for nine years. Her interests include keeping fit, skiing and reading. Copyright ©2011 Clemmence & Co. All Rights Reserved.